The UL Host Test Tool is the most comprehensive test tool for any Issuer, Acquirer, Acquirer Processor or Merchant that wants to test their payment infrastructure host functionality. As an Acquirer, Acquirer Processor or Merchant you want to test an acquirer network’s ability to generate correct messaging. As an Issuer, you want to test the issuer host system’s ability to process authorization messages. 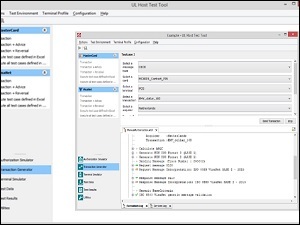 The UL Host Test Tool assists you in achieving your test objectives for both acquiring and issuing host systems. The UL Host Test Tool allows you to test the main links in your payment network, using simulation of the links, before going into production. Thus, avoiding any major disruption in your payment infrastructure. Ultimately, the UL Host Test Tool is the ideal test tool to prove all the major links in the network (card, terminal and host) work correctly. Transaction Generator - The Transaction Generator allows you to simulate transactions as if they were coming from real cards and real terminals. It is used for testing authorization and financial message processing of an issuer host. Terminal Simulator - The Terminal Simulator acts as a fully configurable POS or ATM device and provides clear and detailed information on both the card-to-terminal as well as the terminal-to-host interface. It is used for checking the complete payment transaction from cards issued or mobile payment applications to an issuing host. Authorization Simulator - The Authorization Simulator allows you to simulate an issuer. It confirms the correct generation and processing of authorization messages by an acquirer host infrastructure. By default, a range of messaging protocols is supported (e.g. Mastercard’s BankNet, Visa’s VisaNet). Other protocols can be developed if requested. Chip card reader for both contact and contactless cards.